Patchy Work of Mini Grey: WIP Wednesday Week 8. Work In Progress Wednesday, already the weeks are slipping by. 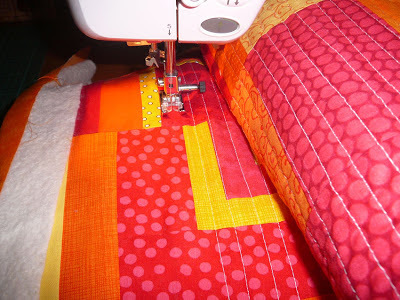 I have sandwiched my sunny table runner and only have about 6 inches left to quilt. Nothing fancy, just the usual straight up, pivot, straight back down again. It's my friends birthday tomorrow but I'm not going to give this to her till Saturday night when we are going out for tea to celebrate. 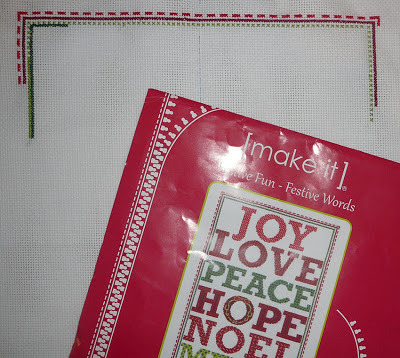 Check out what the rest of the WIP Wednesday ladies are up to here. And now for something totally different, look! It is a cross stitch! I brought this at Spotlight when we were in Perth for Christmas in 2011. It has sat unopened on my shelf since them. I thought it would be fun to do in the car on htose long drives. I went to my girl friends house on Saturday, she is an avid cross stitcher, I took it along for her to get me started. This is where I got up to.... its going to take awhile but I have till Christmas! I can not wait to see the finished table runner. Your colour choices excite me. Great start on the cross stitch!